This month, I examine a potential buying opportunity for the Active Asset Allocator in European equities and explain how the German stock market will likely trigger a move. I highlight the ongoing dominance of the FAANG stocks, which continue to drive the broad market averages higher and will likely continue to do so for the remainder of this bull market. I also discuss current stock market valuations and some technical indicators that are breaking down. These include an increasing number of stocks making new lows vs those making new highs and an increasing number of stocks trading below their long-term moving averages. In bonds, I cover the outlook for government bond yields in the US and Europe, while also discussing the possibility that the Federal Reserve in the US is potentially trapped and unable to raise short-term interest rates without popping the stock and bond market bubbles. I argue there is still some room for EU government bonds to rally in a risk-off move in the stock market, which is why the Active Asset Allocator currently holds a mix of cash, bonds and gold for capital preservation. 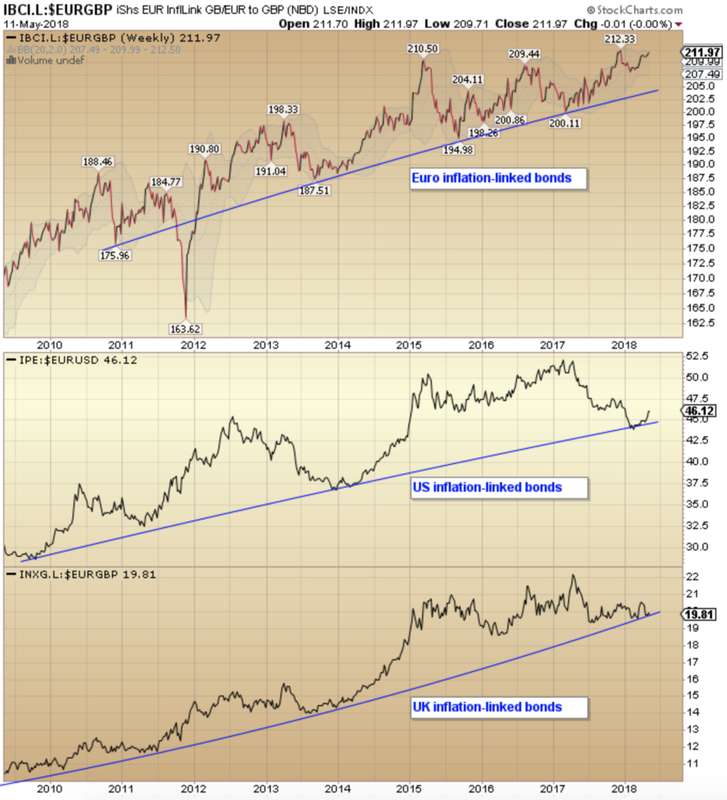 On to gold, I highlight an upcoming investment opportunity for precious metals and also discuss an excellent research report from the folks at GaveKal - "The Upcoming Monetary War, with Gold as an Arbiter". Let's start this month's Investor Update with some potentially positive news. European stocks, as measured by the Eurostoxx 600 Index, have traded in very broad range for the last 20 years. The Eurostoxx 600 Index hit a resistance zone of 400-415 in 2000, 2007 and again in 2015, failing to break out on each occasion. We are still below that resistance line today but getting close again. The Index traded at 403 in January 2018 and is back at 392 this week. While there is a negative divergence appearing on the Relative Strength and Momentum indicators, suggesting that the current rally is losing strength, if the Eurostoxx 600 can break out and hold above 405-415, that would be a significant bullish development. In that instance, the Active Asset Allocator would take a long position in European shares, with a closing stop below resistance. If the Eurostoxx 600 is going to break out to new all-time highs, it will likely be led higher by Germany, the strongest market in the region. The German economy grew by +2.2% in 2017, its fastest pace in over five years while its fiscal surplus reached 1.2 percent of GDP, the most since the country’s reunification. Despite momentum slowing somewhat in the first quarter of 2018 due to a contraction in manufacturing output, expectations for another year of solid growth remain on track. All of this positive news has not been lost on the German stock market, which has already more than doubled since 2012. The Dax could be setting up to break out to new all-time highs, or a head and shoulders topping pattern may be in the process of forming. We will know soon enough. If the Dax can break and hold above 13,597 it will likely coincide with a break out to new all time highs in the Eurostoxx 600 Index. The Active Asset Allocator is on watch. 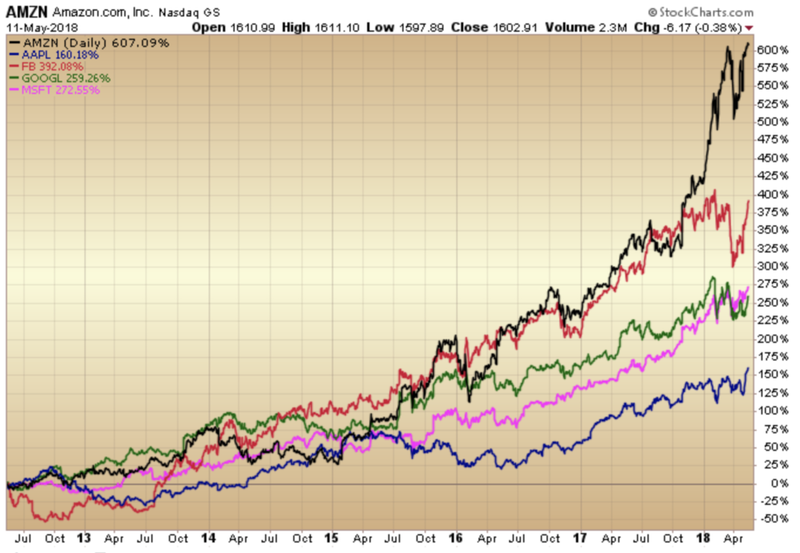 In another positive for the stock market, the tech giants, which have led from the front for the last 9 years, continue to charge. Apple($985BN), Amazon ($775BN), Microsoft ($760BN), Google ($770BN) and Facebook ($550BN) are the five largest companies by market capitalisation trading on the New York Stock Exchange. Together, they are valued in excess of $3.8 trillion. They are the generals of Wall Street, have led from the front and their performance will drive this bull market until its conclusion. While a few of them stumbled following their 1Q 2018 earnings reports last month, they rallied hard last week and have continued to outperform the S&P 500 to varying degrees. The equity bull market will continue until these giants reverse lower. The FAANG stocks are a very crowded trade, but so far, the longs have been rewarded. Despite the good news and the appearance of relative strength of the broad market indices, a closer inspection reveals some potential signs of weakness. In a healthy bull market, the majority of stocks rise in a bullish trend, with the majority making new 52-week highs compared to those making new lows. As a bull market ages, the rising trend loses momentum and fewer stocks participate until the end, when the market runs out of steam and new lows start outpacing new highs and the market rolls over. You can see this trend in play in the chart below, which captures the number of stocks on the New York Stock Exchange, making new highs minus those making new lows. As we turned from bull market to bear market in 2007/2008, the trend in stocks making new highs deteriorated versus those making making new lows. The same pattern was evident before the sharp stock market corrections in 2011 and 2015 and the same pattern is evident again today. We do not have to see a stock market collapse from here, but we could. Unless new highs start outpacing new lows again, I expect at least a sharp correction to unfold shortly. I lowered the equity allocation in my Active Asset Allocator strategy from 20% to 0% on 2nd March 2018 and am patiently waiting before I make my next move. On a similar note, the following chart measures the percentage of stocks in the S&P 100 Index trading above their 200 day moving average. In a bull market, you should expect to see the majority of stocks participate in the advance, but today, just over half the market is in rally mode. This can change. The stock market could simply be pausing for breath before the next move higher, but the weakness is concerning. We are in year ten of this bull market. The previous few ended with a similar drop off in market breadth before price gave way and the broader indices followed lower. Regular readers will know of my concerns for the stock market given where we are in the current cycle. John Hussman of the Hussman Funds articulates these concerns much better than I ever could and has the data to support his bearish leanings. Hussman has not played the bull market in stocks at all well in recent years, but his analysis is well worth reading. In his latest market comment - Comfort is Not Your Friend - Hussman imparts the following words of wisdom. Markets peak when investors feel confidence about the economy, are impressed by recent market gains, and are comforted by the perception of safety and resilience that follows an extended market advance. So several features generally go together: 1) extreme optimism about the economy and corporate earnings, 2) depressed risk-premiums, and 3) steep market valuations. Poor subsequent market returns ultimately follow, though not always immediately. In contrast, markets trough when investors are frightened about the economy, are terrified by recent market losses, and are paralyzed by the perception of risk and fragility that follows an extended market decline. So several features generally go together: 1) extreme pessimism about the economy and corporate earnings, 2) steep risk-premiums, and 3) depressed market valuations. Strong subsequent market returns ultimately follow, though not always immediately. The chart below illustrates this regularity. The areas shaded in red are rather comfortable periods, featuring an unemployment rate below 5% and within 1% of a 3-year low, an S&P 500 price/revenue ratio above 1.15, typically reflecting a period of strong recent market gains, and an ISM purchasing managers index above 50, reflecting expectations for an expanding economy. Notably these periods of comfort were followed by S&P 500 total returns averaging zero over the following 3-year period, with deep interim losses more often than not. I think we've got some green bars to look forward to in the next three years when the US unemployment rate crosses back above 5% (and within 1% of a 3-year high), the S&P 500 Price/Sales ratio falls below 1.15 (from 2.16 times currently) and the ISM Purchasing Managers Index declines to below 50. For the full Hussman Market Comment, please follow the link. However, the stock market has to top first, before those green bars come in to view. A chart comparing the relative performance of the S&P 500 to the US 10-year government bond yield suggests that the trend of falling equity prices and rising government bond yields is set to continue (in the US). If the blue support line gives way, this head-and-shoulders top formation should break down and the trend lower should accelerate. This is a significant problem for folks investing in and managing balanced portfolios. Historically, government bonds have acted as a shock absorber whenever stock markets have taken a plunge. With bond yields already on the floor, there is less room for them to fall (and bond prices to rise) when capital flows out of riskier assets. I still think there is some room for EU government bonds to rally in a risk-off move in the stock market, which is why the Active Asset Allocator currently holds a mix of cash, bonds and gold for capital preservation. The US Federal Reserve Chairman, Jerome Powell, would desperately like to raise short-term interest rates to provide a cushion for the 'next time down'. He can't raise rates too quickly or he will prick the debt and equity bubbles and lead the US economy into recession. He is also hesitant to boost short-term interest rates faster than the market has already discounted because he will invert the yield curve. Inverted yield curves (when 2 year yields > 10 year yields) ALWAYS signal a recession is not far away. If long-term yields continue to rise, Powell has a little more room to raise short-term rates, but not much. Today, 2 year yields in the US have surged to 2.6%, up from just 0.6% 12 months ago, while 10-year yields have reached 3.0%. The spread between 2 and 10-year yields has narrowed to just 43 basis points. Once the yield curve starts to steepen again, recession will be upon us. Unlike fixed interest rate government bonds where price moves inversely to changes in nominal interest rates, inflation-linked bond (ILB) prices are sensitive to changes in real interest rates, rather than nominal interest rates. This means that inflation linked bonds will rise in price and provide a hedge for investors against unexpected increases in inflation. Interest rates and government bond yields can rise, but as long as inflation rises at a faster rate, inflation linked bonds will increase in value. ILB's are under-owned, yet well placed to protect investors in a rising interest rate and rising inflationary environment. ILB's are playing an increasingly important role in the Active Asset Allocator. Medium-term investor cycles (IC's) in the gold market generally last 6 months, though they can run a little shorter (July-December 2017) or a little longer (December 2016-July 2017). 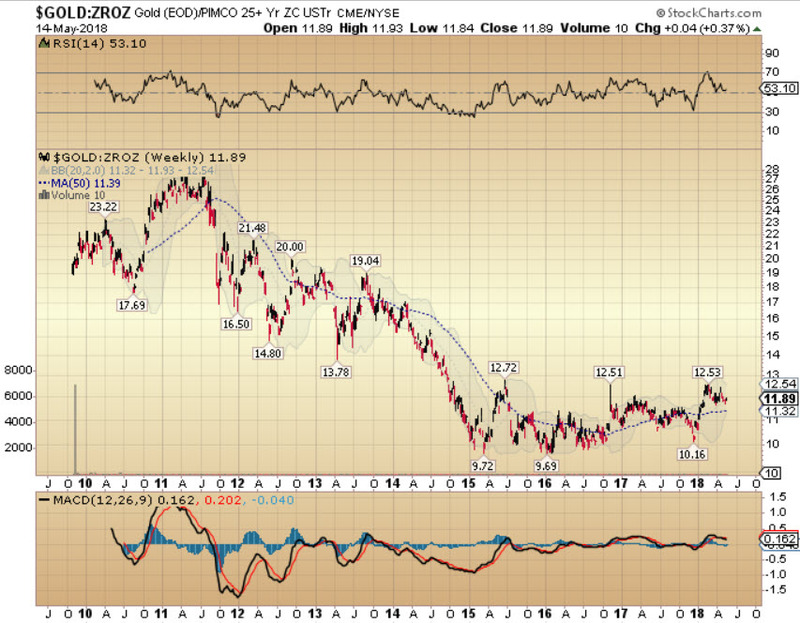 Today, gold is approaching the end of its current IC. Investor cycle lows (ICL's) are usually accompanied by heavy selling in the gold market. However, during bull markets, the selling does not have to be that strong. We are approaching a time now where gold should be seeking out a low and if its the start of a new IC, strong gains lie directly ahead. If gold tops early and fails to rally, then the ICL will likely be postponed to early June. The second half of 2018 should be a lucrative time for precious metals investors. I came across an interesting article from the folks at GaveKal Research entitled "The Upcoming Monetary War, with Gold as an Arbiter". (I posted another article from GaveKal Research last week. Special thanks to Charles Gave who gave permission to share). This is the second article and it is well worth a read. Charles Gave discusses the potential for conflict between the US and China, but he cogently argues that the fight will be less about trade and more about the struggle for dominance between the US dollar and the renmimbi. Gave argues that since the 9/11 attacks, the US has pulled back on allowing unconstrained global access to the USD. The US is exerting its power to freeze assets of certain misbehaving countries (Iran, Russia), while only allowing the well-behaved access to USD reserves. This is a dangerous game the US is playing, particularly given the trajectory of ever-increasing US budget deficits in the years ahead, which will need to be financed. China seems set on de-dollarizing the world according to Gave. China has recently offered renmimbi swap lines to multiple central banks, so as to provide emergency lending in times of crisis. China has also recently launched crude oil (and gold) futures contracts traded in renmimbi. Gave notes that China is planning to become the world's biggest financial market by 2047, when Hong Kong reverts to mainland control, with Singapore playing a complimentary role, just as London has in recent decades to New York. The performance of gold priced in USD versus US long duration zero coupon bonds suddenly became a lot more interesting. As Charles notes, in recent years, we have been in a stalemate, but he doubts that situation will last much longer. I hold a similar view.